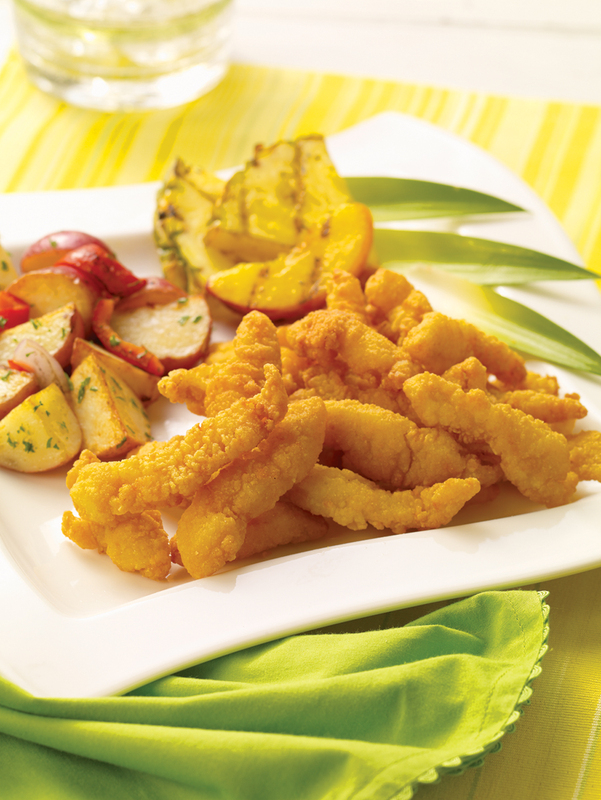 Sea Watch Thick-n-Tasty Breaded Clam Strips are made exclusively from the tongue of the Atlantic Surf Clam and sliced ¼ inch thick, for more meat to breading ratio. Great alone or when served with other seafood or in recipes. Products are packaged in all popular sizes including bulk, 4 oz., and 6 lb. sizes. Sea Clams have been under federal management since 1977 and is considered by many to be one of the best-managed fisheries in the world. KEEP FROZEN: until ready to use. Deep Fry: 350°F. for 75 seconds. Surf clam meat and surf clam juice, bleached wheat flour, water, yellow corn flour, soybean oil, leavening (sodium acid pyrophosphate, sodium bicarbonate, monocalcium phosphate), salt, dextrose, sugar, nonfat milk, yeast, whey, guar gum, modified cellulose, spices, eggs, colored with oleoresin paprika and annatto extract, sodium tripolyphosphate (to retain moisture), yeast extract. Fried in soybean oil. CONTAINS WHEAT, MILK, EGGS. Sea Watch: ATT31 – 24/4oz. Sea Watch: ATS31 – 6lb.